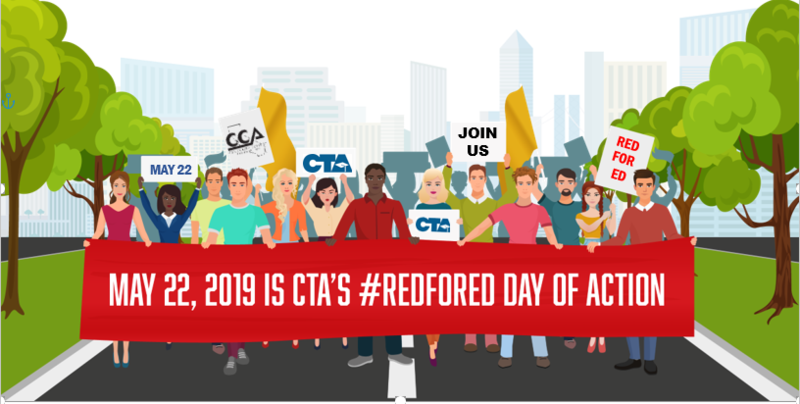 #RedForEd Day: Take Action for Our Students on May 22Let’s make history together! RSVP today to join the action in Sacramento on May 22. May 22 will be a statewide #RedForEd Day of Action, including a massive rally for public education in Sacramento. We will call on elected leaders to address chronic underfunding of our schools and invest in our students. We will fight back against blatant attacks on public education and those who want to privatize our schools. Join thousands of your fellow educators to make history together! The national #RedForEd movement is about standing up for the resources and supports our students, schools and communities deserve. Let’s bring the #RedForEd wave to our Capitol. RSVP today for the Sacramento RallySpread the word on social media. RSVP and invite your community to join you on FacebookCheck out our digital toolkit with more details and graphics to sharee. Get your Red ready. Shop union-made attire at our RedForEd online store.